Long-term change in ground-layer vegetation of deciduous forests of the North Carolina Piedmont, USA Blackwell Publishing, Ltd.
*Correspondence: Kristin Taverna, Virginia Department of Conservation and Recreation, Division of Natural Heritage, 217 Governor St., 3rd Floor, Richmond, VA 23219, USA (tel. +1 434 9230107; e-mail [email protected]). increased woody species density, (ii) the frequency of shade-tolerant woody species had increased in the understorey as a long-term consequence of elimination in the early twentieth century of frequent ground fires and grazing by domestic stock, and (iii) the extent of compositional change has been highest in more productive stands because establishment and growth of new species should be less resource-limited on such sites and deer are known to preferentially graze on sites with more nutrient-rich foliage (Swift 1948). fire has been suppressed since the early 20th century, the original forest understorey vegetation experienced frequent, low-intensity fires set by aboriginal populations, and subsequently by early European settlers, to suppress woody growth and encourage an herbaceous understorey favourable for game and domestic animals (Hatley 1977; Frost 1998). Grazing, which may have mimicked some effects of low-intensity ground fires by suppressing woody growth, persisted in the hardwood forest stands until acquisition for Duke University in the 1920s (McDonald et al. 2002). The plots used in this study were originally selected in 1977 for their mature hardwood canopy and were required to show no more than minimal evidence of post-1900 human disturbance (Peet & Christensen 1980; Christensen & Peet 1984). The forest stands all appeared to have retained a hardwood canopy prior to 1900, although livestock grazing and selective timber harvest were likely pervasive during the 19th century. Although the hardwood stands sampled have remained free of overt anthropogenic disturbance for over 100 years, other forms of disturbance have occurred during this interval. In particular, white-tailed deer (Odocoileus virginianus) populations of the northern North Carolina Piedmont more than doubled over the 14-year period of 1985 – 99 (North Carolina Wildlife Resources Commission, unpublished data). Studies conducted elsewhere in North American temperate forests have found deer to be responsible for significant declines in richness and cover of understorey vegetation (e.g. Waller & Alverson 1997; Rooney et al. 2004), so such impacts were to be expected in the Duke Forest, albeit perhaps to a lesser degree owing to the infertile soils causing foliar nutrient contents to be relatively low. Hurricanes provide an additional source of disturbance. In particular, Hurricane Fran passed through the region in September, 1996. The eye of Fran passed 15 miles east of Duke Forest, and the associated strong north-east winds (up to 35 m s−1) caused severe damage, making it the most destructive natural disaster ever to strike North Carolina (Carpino 1998). Damage in Duke Forest from Fran was patchy and in mature hardwood forests occurred along river bottoms due to flooded soil conditions, as well as on exposed ridge slopes and tops (Carpino 1998). nomenclature was standardized to conform to Kartesz (1999). In addition, to control for possible taxonomic inconsistencies across years, separate data sets were created for each year for calculations of species richness and composition. For comparison of species richness, we maintained full species identifications for most taxa and grouped to genera those species considered particularly difficult to split from related taxa based on vegetative characteristics. For comparison of species composition, all potentially problematic species were grouped to genus and all family level and unknown designations were removed. The combined final species list for richness contained 331 taxa with 314 identified to species, 11 to genus, and 6 to family or above. The final species list for comparison of composition contained 302 taxa, with 285 identified to species and 17 to genus. All woody (shrub and tree) species were assigned a shade tolerance value of low, mid or high, following the United States Department of Agriculture designations (USDA 2002). was assessed using a Monte Carlo test. The direction of compositional change between the two observations of each plot was examined by constructing vectors between plot pairs on the two-dimensional ordination (McCune & Grace 2002). The length of each vector represents the amount of compositional change based on dissimilarity between plot observations. The relative positions of the 1977 and 2000 observations on an ordination axis were compared with a two-sample ttest (Peterson & McCune 2001). Plots that experienced hurricane damage were identified separately in the ordination diagram to examine the direction and extent of compositional change in relation to other hardwood plots. An indicator species analysis (Dufrêne & Legendre 1997) was performed in - to examine relationships of individual species to the 1977 and 2000 sample periods. The test provides a method for assessing which species have the strongest affinities to one time period, thereby emphasizing species with the strongest influence on compositional change over time in the NMS ordination. The indicator value for each species was calculated by combining the relative abundance and relative frequency of each species in each year, and the highest indicator value (IV max) across years was used as the overall indicator value for each species. The statistical significance of IVmax for each species was evaluated using a Monte Carlo test with 1000 randomizations.         Spearman’s rank correlation was used to test the correlation of environmental factors (Table 1) with change in richness at 25 m2 and 1000 m2 for species grouped by growth form (herb, shrub or tree). A correlation analysis was also used to examine the change in richness for each growth form in relation to the original 1977 richness at each scale. To assess whether change in species composition varied with environment, the lengths of the paired plot vectors in the NMS ordination were compared to the primary environmental ordination axis. Individual environmental variables were first overlaid on the NMS ordination with a vector biplot as implemented in -. The angles of each environmental vector in the ordination indicate the direction of highest correlation, and the lengths represent the strength of the correlation. A varimax rotation was used to maximize the alignment of environmental variables with one primary ordination axis (Mather 1976). Correlations between the ordination axes and environmental variables were calculated with Pearson’s r2. The lengths of the pairedplot vectors were correlated with 1977 plot positions on the primary environmental ordination axis using Spearman’s rank correlation to test whether the extent of compositional change between plots varied with environment. Results      Total species richness (across all plots) decreased over time with much of the loss driven by a decrease in herb species. Peet & Christensen (1980) recorded a total of 272 species throughout the hardwood plots in 1977, whereas the 2000 resurvey recorded 252 species for a net loss of 20 (see Appendix S1 in Supplementary Material). Total loss of native species was 70, with 83% of the decline due to a loss in herbs (58 species). Fortytwo new native species occurred in 2000 (35 herb species), and 7 new exotic species were recorded (1 tree, 1 shrub, and 5 herbs; Appendix S1). In addition to overall herb loss, the number and abundance of the less common native herb species declined over time. Sixtyone percent (89 out of 145) of the herb species that occurred in 10 or fewer plots in 1977 declined in plot frequency, and more than half of those that declined (52 species) were not recorded at all in 2000. The loss in overall diversity contrasts with the change observed at the subplot (25 m2) and plot (1000 m2) scales for paired plots. At 25 m2 there was no significant change in total or native species richness (Table 2). Total and native species richness increased at 1000 m2 across a majority of the plots (22 out of 36), but only total species richness showed significant increases (P ≤ 0.05) likely due to the new exotic species recorded in 2000 (Table 2). Plots that incurred significant damage from Hurricane Fran showed some of the greatest increases in total species richness; all five plots increased in total richness by 12–25 species at 1000 m2 and four increased in total species richness at the 25 m2 scale. Richness showed significant declines at both 25 m2 and 1000 m2 for all herbs and native herbs (Table 2). This contrasts with the change in tree richness, which showed strong increases at the subplot and plot scales (Table 2), but no increases in total tree richness across all plots (net loss of two species, Appendix S1). The same assemblage of tree species dispersed across all plots, thereby increasing mean plot-level richness in the context of overall species loss. Shrub richness did not significantly change at 25 m2, but there were significant increases in both total and native richness at 1000 m2. All hurricane plots increased in richness at 1000 m2 across all growth forms (results vary for 25 m2), and the greatest increases were for trees (5–11 species per plot) and herbs (2–13 species per plot). *Plots with increase = Total number of plots (out of 36) that increased in species richness. †Plots with decrease = Total number of plots (out of 36) that decreased in species richness. Fig. 1 NMS ordination of plots in species space with paired-plot vectors from the 1977 to the 2000 plot observation. Symbols are plots coded for year:  = 1977,  = 2000, + = 1977 hurricane plot, × = 2000 hurricane plot. Fig. 2 NMS ordination of plots in species space with correlation vectors of environmental variables (radiating from centre). Ordination represents same plot configuration as Figure 1. All correlation vectors have r2 = 0.250. Length of correlation vectors represents the strength of the correlation and angle indicates direction of highest correlation. Symbols are plots coded for year:  = 1977,  = 2000, + = 1977 hurricane plot, × = 2000 hurricane plot. Group is a categorical variable for year (1977, 2000). All other environmental variables are defined in Table 1.
virginiana. Some historically dominant (and less shade tolerant) oak and hickory species also exhibited increases in subplot and plot frequency, with Quercus falcata, Quercus alba and Carya ovata showing the greatest increases over time (Appendix S1). The oak or hickory species that declined in plot frequency or had strong declines in subplot frequency were Quercus coccinea, Quercus marilandica, Quercus michauxii, Carya glabra, and Carya pallida (Appendix S1). The only shade intolerant tree species that increased in subplot and plot frequency were Liriodendron tulipifera, Liquidambar styraciflua and Quercus phellos. Liriodendron is highly indicative of plot composition in 2000 (IVmax P < 0.05; Table 4) and it had the highest increase in subplot occurrences (+105; +6 in plot frequency) across all tree species. Liquidambar increased in subplot frequency by 26 and plot frequency by 2, Quercus phellos increased by 1 and 8 for subplot and plot frequency, respectively (Appendix S1). Both Liriodendron and Liquidambar are well known to increase in abundance following modest canopy damage such as many plots sustained during Hurricane Fran, although the increases in these species were not restricted to hurricane-damaged plots. 25 m2, but no significant relationships were found at 1000 m2 (Table 5). Herb species had the strongest correlations with environment, with positive correlations (increased richness over time) associated with pH and soil cations (Ca, Mg, K) (Table 5). Change in herb species richness is positively correlated with percentage sand and negatively correlated with percentage silt and percentage clay. Note that collinearity of the soil attributes makes inferences with respect to causation problematic; soil cation variables and pH are generally positively correlated (0.0001 < P < 0.01), and percentage sand varies inversely with percentage silt and percentage clay as all three together add to 100. Change in tree species richness showed no relationship with pH or soil cations and was only moderately correlated with percentage silt (Table 5). The changes in tree and herb richness are both negatively correlated with elevation (Table 5). This relationship likely reflects soil variation as there is only moderate variation in elevation within the study area (80 –250 m), but soil moisture and nutrient availability vary with topographic position and thus elevation (Peet & Christensen 1980). Low, mesic, nutrient-rich sites tended to increase in tree and herb species richness over time, while higher, infertile, drier sites generally decreased in richness. Change in shrub richness was not correlated with any examined environmental variables. Only change in herb richness was significantly correlated (positively) with the original (1977) plot richness, indicating that plots with higher richness in 1977 tended to increase in herb richness to a greater extent over time. Change in overall species composition at 1000 m2 is moderately correlated with environment (Spearman’s rank correlation: r = 0.38, P = 0.023), based on the analysis of paired-plot vector length with 1977-plot position along axis 1 of the NMS ordination (Fig. 1). The positive correlation means that vector length increased from left to right along axis 1, and thus that plots with higher soil cations, pH, and percentage sand exhibited greater compositional change (Figs 1 and 2). Nonetheless, it is important to note that the overall coefficient of determination (r2) of plot vector length with axis 1 is low (0.103, Table 3), which implies that although there is some relationship with environment, compositional change at 1000 m2 occurred across all plots, largely independent of the measured environmental factors. This is also represented by the nearly orthogonal position of the ‘group’ (year) vector relative to the primary environmental vectors in the NMS vector biplot (Fig. 2). and trees. Some authors have also suggested that the rate of succession is a function of site conditions (Peet & Loucks 1977; Fralish et al. 1991). Our results (for herbs and trees) suggest that change in late-successional stands will likely be greater in mesic, fertile sites. The moderate positive correlation between change in overall species composition (as represented by plot vector length in Fig. 1) and environmental variables provides support for our expectation of greater overall species change in areas of relatively higher soil fertility and low topographic position. This result differs from the above discussion of species richness in that it pertains to change based on the entire species assemblage within a plot, rather than just number of species. The result suggests that change in overall species composition is greater in mesic, low-elevation, fertile plots (due primarily to loss of herbs and an increase in tree seedling richness), whereas drier, less fertile sites do not exhibit as much compositional change. The systematic declines in herbaceous species richness, directional changes in composition, and dramatic increases in woody seedling abundance signal important on-going shifts in mature hardwood forests of the Piedmont. Both the past legacy of human disturbance in these forest stands and the current disturbance regimes continue to prevent establishment of the dynamic equilibrium long thought to exist in these mature Quercus– Carya (oak–hickory) hardwood forests (e.g. Oosting 1942; Braun 1950; see also Foster et al. 1992). Some authors have suggested that the current shift toward a more mesic-appearing hardwood forest is typical of latesuccessional stands and that the historic dominance of oak–hickory forests was primarily a consequence of the higher fire frequencies of past centuries (Abrams 1992, 2003; White & White 1996; McDonald et al. 2002). Whether fires should be reintroduced to the ecosystem is a matter of debate, but needs consideration in development of strategies for protecting hardwood stands from future species loss. Exclusion of fire could explain some of the species losses, but these losses are likely to have largely run their course prior to 1977, with the persistence of fire-maintained species restricted to road verges and other artificially maintained openings. Many losses are of species typically associated with mesic closed forest, and these are more likely the victims of the increased deer pressure. The loss of herbaceous species highlights yet another alarming trend: their decline in the protected forest stands of Duke University Forest cannot be attributed to the mechanisms commonly associated with species extinction, such as habitat fragmentation and invasive species (Wilcove et al. 1998; Jolls 2003). This implies a strong need for control of local deer populations until their impact can be adequately assessed, coupled with more research to better understand the mechanisms responsible for herb species declines. Fire-suppression, deer population increases, increased habitat fragmentation, climate change, anthropogenic changes in precipitation chemistry and many other factors potentially influencing composition of mature hardwood forests are likely to be widespread in eastern North America (e.g. Abrams 1992, 2003; Anderson 1997; Frost 1998). Consequently, the lack of stability we observed for mature vegetation of the Carolina Piedmont is likely to be representative of temperate forests in general. Our results suggest that to project vegetation change based on contemporary mature vegetation as the expected endpoint is risky at best and results obtained must be viewed with caution. Acknowledgements Original plot data were collected in collaboration with Norman Christensen of Duke University and Dorothy Allard and Gary Thorburn of the University of North Carolina, with support of NSF grant DEB-7708743. The resurvey benefited from the collaboration of Dean Urban, Katie Bickel and Monique Rocca of Duke University, and was supported by NSF grant DEB-9707551. We thank Jack Weiss for assistance with statistical analyses, and Peter White and Dean Urban for helpful comments on the manuscript. We also thank two anonymous referees for their useful suggestions. Supplementary material The following material is available from http://www.blackwellpublishing.com/products/ journals/suppmat/JEC/JEC965/JEC965sm.htm Appendix S1 Changes in species frequency for Duke Forest hardwood plots, North Carolina, USA, from 1977 to 2000. References Abrams, M.D. (1992) Fire and the development of oak forests. Bioscience, 42, 346 – 353. Abrams, M.D. (2003) Where has all the white oak gone? Bioscience, 53, 927 – 939. Anderson, R.C. (1994) Height of white-flowered trillium (Trillium grandiflorum) as an index of deer browsing intensity. Ecological Applications, 4, 104 – 109. Anderson, R.C. (1997) Native pests: the impact of deer in highly fragmented habitats. Conservation in Highly Fragmented Landscapes (ed. M.W. Schwartz), pp. 117–134. Chapman & Hall, New York, NY. Anderson, R.C. & Adams, D.E. (1978) Species replacement patterns in central Illinois white oak forests. Proceedings of the Central Hardwoods Conference II (ed. P.E. Pope), pp. 285 – 301. Purdue University, West Lafayette, Indiana. Ashe, W.W. (1897) Forest of North Carolina. Timber trees and forests of North Carolina. North Carolina Geological Survey, Bulletin No. 6 (eds G. Pinchot & W.W. Ashe), Winston, North Carolina. Bickel, K.A. (2001) Land use, disturbance, and the spread of non-native plant species in a Piedmont forest ecosystem. M.E.M. Thesis, Duke University, Durham, North Carolina. Braun, E.L. (1950) Deciduous Forests of Eastern North America. Hafner Publishing Co, New York. Brewer, R. (1980) A half-century of changes in the herb layer of a climax deciduous forest in Michigan. Journal of Ecology, 68, 823 – 832. Carpino, E.A. (1998) Ecological determinants of hurricane damage in a Southeastern Piedmont forest. M.E.M. Thesis, Duke University, Durham, North Carolina. Christensen, N.L. (1977) Changes in structure, pattern, and diversity associated with climax forest maturation in Piedmont, North Carolina. American Midland Naturalist, 97, 176 – 188. Christensen, N.L. & Peet, R.K. (1981) Secondary forest succession on the North Carolina piedmont. Forest Succession: Concept and Applications (eds D. West, H. Shugart & D. Botkin), pp. 230 – 245. Springer-Verlag, New York. Christensen, N.L. & Peet, R.K. (1984) Convergence during secondary forest succession. Journal of Ecology, 72, 25 – 36. Daniels, R.B., Buol, S.W., Kleiss, H.J. & Ditzler, C.A. (1999) Soil Systems in North Carolina. Technical Bulletin 314. North Carolina State University, Raleigh, North Carolina. Davison, S.E. & Forman, R.T.T. 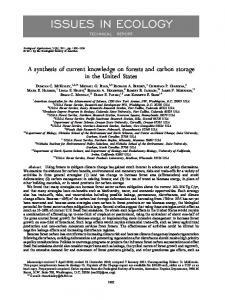 (1982) Herb and shrub dynamics in a mature oak forest: a thirty-year study. Bulletin of the Torrey Botanical Club, 109, 64 – 73. Delcourt, H.R. & Delcourt, P.A. (2000) Deciduous forests. North American Terrestrial Vegetation, 2nd edn (eds M.G. Barbour & W.D. Billings), pp. 357 – 395. Cambridge University Press, Cambridge. Drayton, B. & Primack, R.B. (1996) Plant species lost in an isolated conservation area in Metropolitan Boston from 1894 to 1993. Conservation Biology, 10, 30 – 39. Dufrêne, M. & Legendre, P. (1997) Species assemblages and indicator species: the need for a flexible asymmetrical approach. Ecological Monographs, 67, 345 – 366. Foster, D.R., Zebryk, T., Schoonmaker, P. & Lezberg, A. (1992) Post-settlement history of human land-use and vegetation dynamics of a Tsuga canadensis (hemlock) woodlot in central New England. Journal of Ecology, 80, 773 – 786. Fralish, J.S., Crooks, F.B., Chambers, J.L. & Harty, F.M. (1991) Comparison of presettlement, second-growth and old-growth forest on six types in the Illinois Shawnee Hills. American Midland Naturalist, 125, 294 – 309. Frost, C.C. (1998) Presettlement fire frequency regimes of the United States: a first approximation. Fire in Ecosystem Management: Shifting the Paradigm from Suppression to Prescription. Tall Timbers Fire Ecology Conference Proceedings, No. 20 (eds F.L. Teresa, L. Pruden & L.A. Brennan), pp. 70– 81. Tall Timbers Research Station, Tallahassee, Florida. Hatley, M.T. (1977) The dividing path: the direction of Cherokee life in the eighteenth century. MS Thesis, University of North Carolina, Chapel Hill, North Carolina. Healy, R.G. (1985) Competition for land in the American South: agriculture, human settlement, and the environment. Conservation Foundation, Washington, DC. Jolls, C.L. (2003) Populations of and threats to rare plants of the herb layer. The Herbaceous Layer in Forests of Eastern North America (eds F.S. Gilliam & M.R. Roberts), pp. 105 – 159. Oxford University Press, New York. Kartesz, J.T. (1999) A Synonymized Checklist and Atlas with Biological Attributes for the Vascular Flora of the United States, Canada and Greenland, 1st edn. Synthesis of the North American Flora, Version 1.0 (eds J.T. Kartesz & C.A. Meacham). North Carolina Botanical Garden, Chapel Hill, North Carolina. Keever, C. (1950) Causes of succession on old fields of the Piedmont, North Carolina. Ecological Monographs, 20, 229 – 250. Kelley, T.M. (1994) Effect of white-tailed deer on the understory vegetation of an oak-hickory forest and growth of trees in a white pine plantation. MS Thesis, Illinois State University, Normal, Illinois. Kruskal, J.B. (1964) Nonmetric multidimensional scaling: a numerical method. Psychometrika, 29, 115 – 129. Kwiatkowska, A.J. (1994) Changes in species richness, spatial pattern and species frequency associated with the decline of oak forest. Vegetatio, 112, 171 – 180. Lorimer, C.G. (1984) Development of the red maple understory in northeastern oak forests. Forest Science, 30, 3– 22. Lorimer, C.G. (1985) The role of fire in the perpetuation of oak forests. Challenges in Oak Management and Utilization (ed. J.E. Johnson), pp. 8 – 25. Cooperative Extension Service, University of Wisconsin, Madison. Lorimer, C.G., Chapman, J.W. & Lambert, W.D. (1994) Tall understory vegetation as a factor in the poor development of oak seedlings beneath mature stands. Journal of Ecology, 82, 227 – 237. Luken, J.O. (2003) Invasions of forests in the Eastern United States. The Herbaceous Layer in Forests of Eastern North America (eds F.S. Gilliam & M.R. Roberts), pp. 283–301. Oxford University Press, New York. Manly, B.F.J. (1997) Randomization and Monte Carlo Methods in Biology, 2nd edn. Chapman & Hall, London. Marquis, D.A., Eckert, P.L. & Roach, B.A. (1976) Acorn weevils, rodents, and deer all contribute to oak regeneration difficulties in Pennsylvania. Research Paper NE-356. USDA Forest Service, Northeastern Forest Experiment Station. Mather, P.M. (1976) Computational Methods of Multivariate Analysis in Physical Geography. J.Wiley & Sons, London. McCune, B. & Grace, J.B. (2002) Analysis of Ecological Communities. MjM Software Design, Gleneden Beach, Oregon. McCune, B. & Mefford, M.J. (1999) PC-ORD. Multivariate Analysis of Ecological Data, Version 4.24. MjM Software, Gleneden Beach, Oregon. McDonald, R.I., Peet, R.K. & Urban, D.L. (2002) Environmental correlates of oak decline and red maple increase in the North Carolina Piedmont. Castanea, 67, 84 –95. McDonald, R.I., Peet, R.K. & Urban, D.L. (2003) Spatial pattern of Quercus regeneration limitation and Acer rubrum invasion in a Piedmont forest. Journal of Vegetation Science, 14, 441 – 450. Mielke, P.W. Jr & Berry, K.J. (1982) An extended class of permutation techniques for matched pairs. Communications in Statistics. Part A – Theory and Methods, 11, 1197–1207. Mielke, P.W. Jr & Berry, K.J. (2001) Permutation Methods: A Distance Function Approach. Springer Series in Statistics. Springer. National Climatic Data Center (2001) Monthly Station Normals of Temperature, Precipitation, and Heating and Cooling Degree Days 1971–2000, North Carolina. No. 81. National Oceanic and Atmospheric Administration, US Department of Commerce. Oksanen, L. (1976) On the use of Scandinavian type class system in cover estimation. Annales Botanici Fennici, 13, 149–153. Oosting, H.J. (1942) An ecological analysis of the plant communities of Piedmont, North Carolina. American Midland Naturalist, 28, 1 – 126. Osborne, J.S. (1993) The White-Tailed Deer in North Carolina. North Carolina Wildlife Resources Commission, Raleigh, North Carolina. Palmer, M.W. (1990) Spatial scale and patterns of speciesenvironment relationships in hardwood forests of the North Carolina piedmont. Coenoses, 5, 79 – 87. Peet, R.K. & Christensen, N.L. (1980) Hardwood forest vegetation of the North Carolina Piedmont. Veröffentlichungen Geobotanik Institut ETH. Stiftung Rübel, 69, 14–39. Peet, R.K. & Christensen, N.L. (1988) Changes in species diversity during secondary forest succession on the North Carolina piedmont. Diversity and Pattern in Plant Communities (eds H.J. During, M.J. Werger & J.H. Willems), pp. 233 – 245. SPB Academic Publishing, The Hague. Report "forests of the North Carolina Piedmont, USA"